Having performed some basic field-testing, we’ve determined that you can feel the impact of a shot from a Rival blaster even through thick padded clothinga gambeson and leather armour. It’s not been tested with the sort of modern armour expected to be in the game yet, but tests are promising so far. Plus, the blasters themselves are gorgeous. I’ve picked up an Apollo myself, and while it’s the cheapest one and manual cocking, it looks really good. 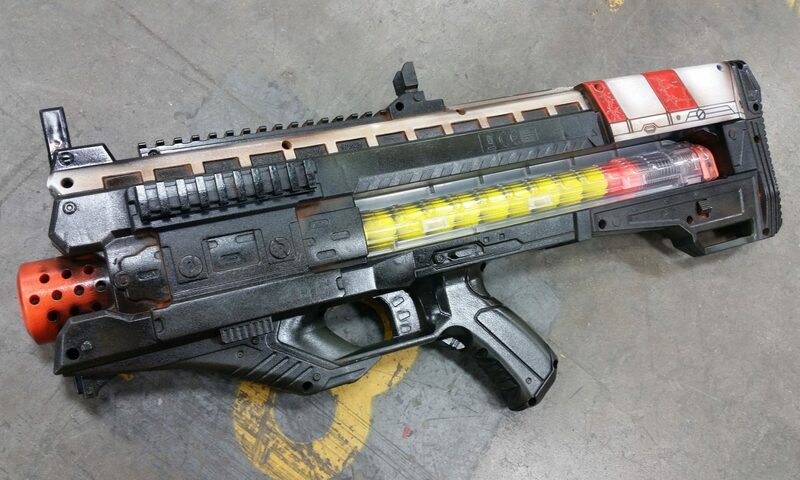 It also requires next to no work to modify as it has no Nerf iconography in the plastic – a paint job is all that’s needed. While more extensive tests are needed, the general thought on ranged combat is to do away with any kind of calls and simply go back to basics – if you feel the blow, you take the blow. Something that’s been suggested is the idea of making standard Nerf hardwaret-Strike, N-Strike Elite, Zombie Strike, Deadlands, Accustrike, etc be civilian weaponry while the Rivals represent military hardware. Civilian weapons are less likely to get through military armour, but still pack a punch against other civilians. I like the idea in theory, but I’m still to be entirely sold on it. What I like about the Rivals is they seem to take away the invulnerability provided by thick clothing or a stiff wind, and while we may need to conduct a lot more playtesting before we finalise ideas, it may be the closest thing we have to running a solid LRP combat system based on ranged impacts without using airsoft weaponry.